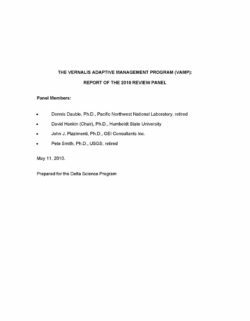 Panel members were asked by the Delta Science Program to carry out an independent review of a 12-year VAMP (Vernalis Adaptive Management Plan) experimental program designed to develop water management measures that would provide protection to juvenile Chinook salmon migrating through the San Joaquin River system and associated Sacramento-San Joaquin River Delta (Delta) waterways. 1) Do the results to date from the VAMP study provide useful scientific information about the relationship between salmon survival and each of the following factors: Flows, Exports, and Barrier installation at the head of Old River? 2) How can the results from the VAMP to date be used to inform the State Water Resources Control Board's (SWRCB) current efforts to review and potentially revise the San Joaquin River flow objectives and their implementation? 3) How can the experiences to date from the VAMP study be used in a scientific manner to inform future monitoring and study efforts related to determining appropriate flow, operational, and water quality requirements to protect San Joaquin River fisheries (specifically Chinook salmon and steelhead)?